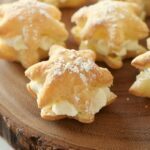 Home » Recipes » Appetizer Recipes and Ideas » Amazing Pepperoni Cheese Pizza Bombs That Explode With Flavor! 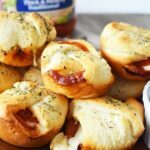 Amazing Pepperoni Cheese Pizza Bombs That Explode With Flavor! 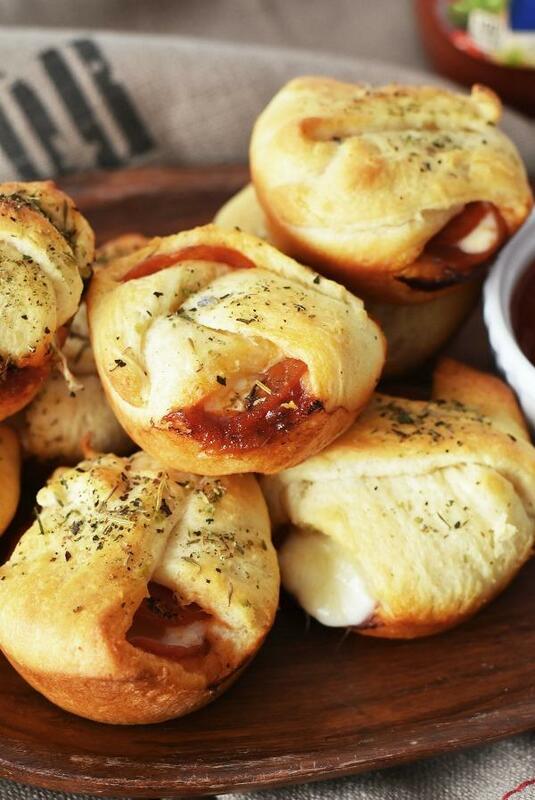 These Pepperoni Cheese Pizza Bombs are perfectly gooey! 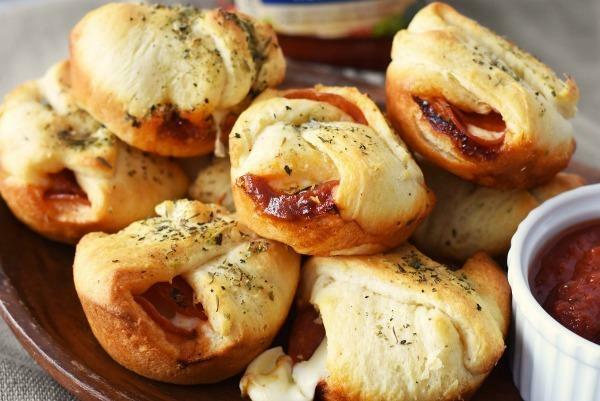 Filled with cheese and pepperoni and enveloped in a soft and buttery crescent roll. 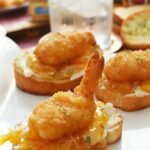 They are easy to make and are perfect for lunch, dinner, or a snack! This post contains affiliate links. How many ways can I count my love for pizza? It is always satisfying. I love the gooey cheese, sauce, spicy pepperoni and crispy crust. Plus, when I see those delivery boxes, I really get excited! But sadly, I make the most lackluster homemade pizza! Can anyone say “tasteless blob of dough“? Yes, I confess I am the worst traditional from scratch pizza maker ever. I am lucky if the pizza even lifts of the stone. However, I can make pizza from naan bread, English muffins, or these mega delicious Pepperoni & Cheese Pizza Bombs. Have you ever tried a Pepperoni & Cheese Pizza Bomb? They are totally delicious and encompass the tasty flavors of pizza in one slightly golden, crispy, yet flaky bite. I only recently discovered the beauty and magic of crescent dough so i have basically been wrapped up all sorts of yummy fillings in this easy to work with dough. 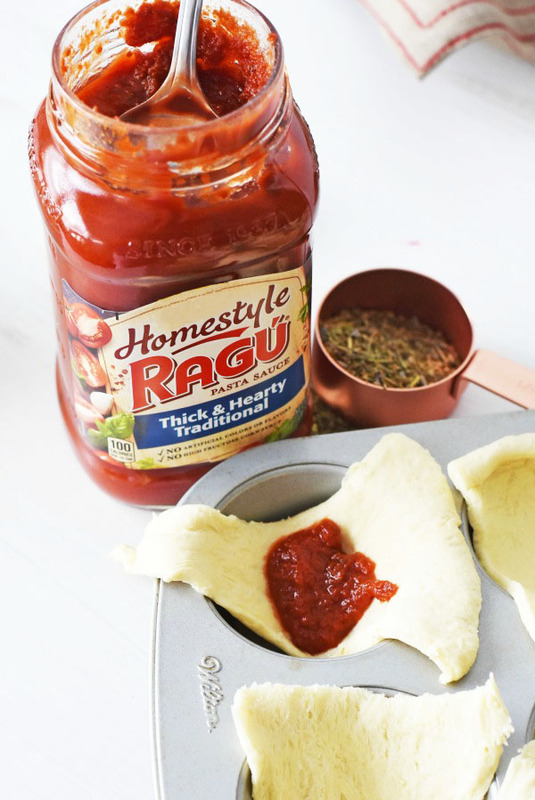 I used Homestyle RAGÚ® Pasta Sauce Thick and Hearty Traditional in my Pizza Bombs. It is one of my top three store-bought sauce choices and it worked perfectly in this recipe. A healthy teaspoonful in each pizza bomb makes for the perfectly balanced party in your mouth experience. Plus, you can heat a side bowl of pasta sauce to dip your bombs into for an extra boost of flavor! 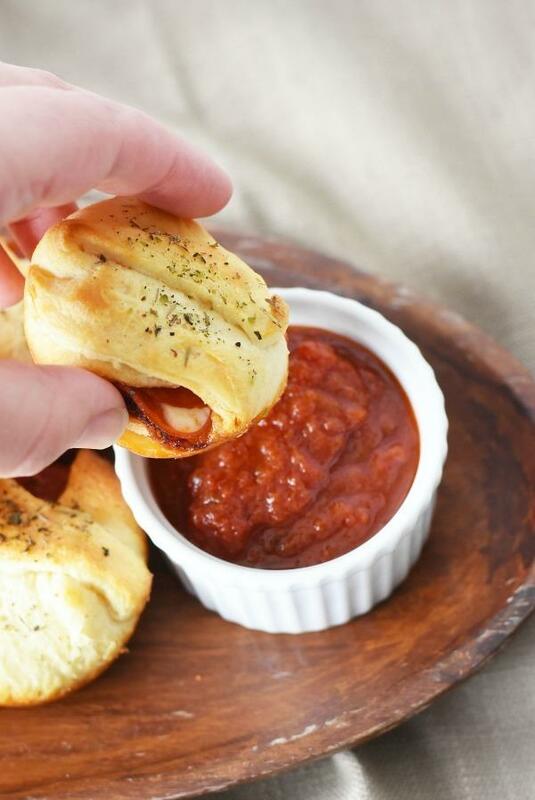 Everyone loves these easy, cheesy, Pepperoni Pizza Bombs! 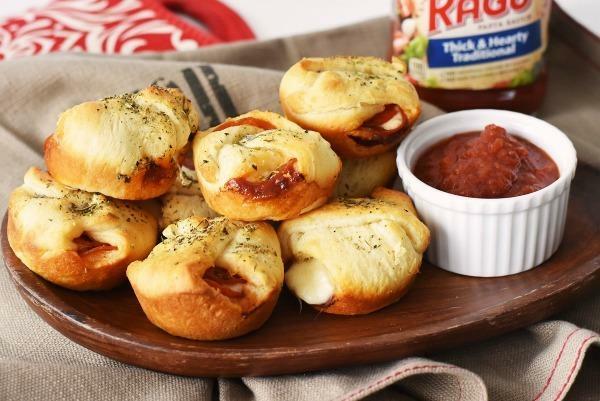 Made with Crescent roll dough, these easy and delicious pizza bites bake up quickly in the oven. 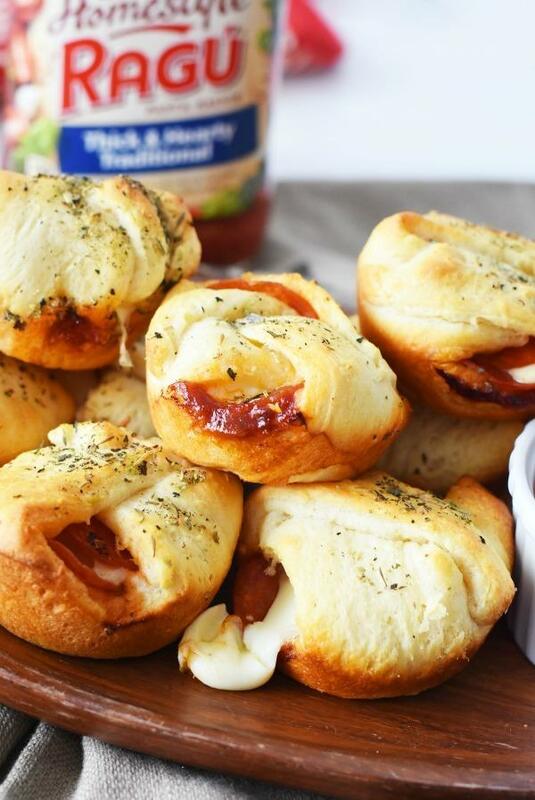 Serve these pepperoni cheese pizza bombs at your next party and amaze your guests! Enjoy while still warm and gooey. Make sure you serve these Pepperoni Pizza Bombs made with crescent dough while still warm to get the full stretchy-cheese, and crispy pepperoni edges experience. Oh my goodness, where do I start with all this deliciousness? Gooey cheese and pepperoni will always score big in my home. I’ll be making these for the guys very soon. The same day produces the best results. Thanks for stopping by! Yummy! these are my kind of treat. I’d have to sneak them away from the family! They’d eat them all up. Oh my goodness! This is really tempting and mouth-watering at the same time! I’ll try to make this on weekends. These look delicious! I’m going to make them when my company comes Saturday night for dinner. 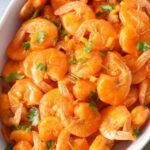 Something kid-friendly that they can even help make (which tends to get their picky little selves to at least TASTE things)! Thanks. And you used a whole slice of roll per bomb? By “Italian Herbs” do you mean Italian seasoning? Would that do or do you suggest something more specific? Italian Herbs is a typically a mixture of oregano, basil, marjoram, thyme and rosemary that you can purchase already mixed. Yes, herbs and seasoning mean the same thing. I dont care for string cheese so what cheese would be a good substitute.? Maybe Swiss? I would say mozzarella. Swiss might be good. Thanks for your reply. I cant wait to make these for my grandson who is coming for a visist with his mom in two weeks. Just made these. At first I was thinking, “I really don’t need to use the cupcake pan.” But, boy am I glad I did! I did a few without the cupcake pan because I did extra and those ones came out flat and messy. The ones in the pan were perfectly formed and looked pretty! Haha thanks for this recipe! Can’t wait to try now! I’ll have to try those pizza Bombs. They look so good. I know my grand children and children I’ll love them. They would not be as good!! They are best right away! I made these for a Labor Day get together and they were a hit. Leftovers are going to be used for a quick and simple meal. Just now making it after going the grocery store for everything. My fiance and I are super excited to try them! Just made these ! Delish ! I added a sprinkle of garlic powder ! I made these for a church function. Quick, easy, tasty. I used a mega blocks of Kroger Brand mozzarella cheese that I cut into cubes. Tasty, melted better, and less expensive. Delicious! Thanks​! How are the bombs rolled or tucked? Hi, you pinch them together in the muffin tin as shown in the images. English muffin pizzas are better — and neater to eat. I’m pretty sure an English muffin has way more bread than a little cresent roll. Google it. Hello, do these reheat well in the microwave? No, they do not. Some readers (check comments) have had great success with toaster ovens. Thank you for stopping by! BETTER THAN ANY PIZZA RESTAURANT!! my 4yr old grand-daughter loves pizza, & she loves these so much that now she won’t eat a real pizza lol! She also LOVES to help make them! Going to try these with fresh mozzarella. Thanks for the idea! Hi, I am not sure how to close these. I can’t figure it out by the pic! Thank you!! Hi, you just pinch them. They bake up and rise so no need to have all spaces closed. I made these for our family Christmas appetizer dinner. Very good and well received by my pizza loving grandsons. Fast and easy to make. I did add seasonings to the pizza sauce. This will be on our go to menu. trying these for our Steelers party Sunday, Thank You…Go Steelers!!! Enjoy! Hope you all love them! I made these for card night for my boyfriend and his friends and they gobbled them up. They were SO easy to make. I’m glad I made a double batch! I will definitely be making these again in the future. WOOT! That is what I love to hear! Thank you for stopping by Kelly! Just made these as a light supper for my husband and myself. They were great! I used delie ham for my husband who doesn’t like pepperoni, and he loved it. Will be making these again. Thanks for the recipe. So glad you loved them! Enjoy! Just made this, it was really quick and easy! I would use a little less sauce in the pizza and add more cheese. Awesome; thanks! More cheese is never a bad thing! Enjoy! 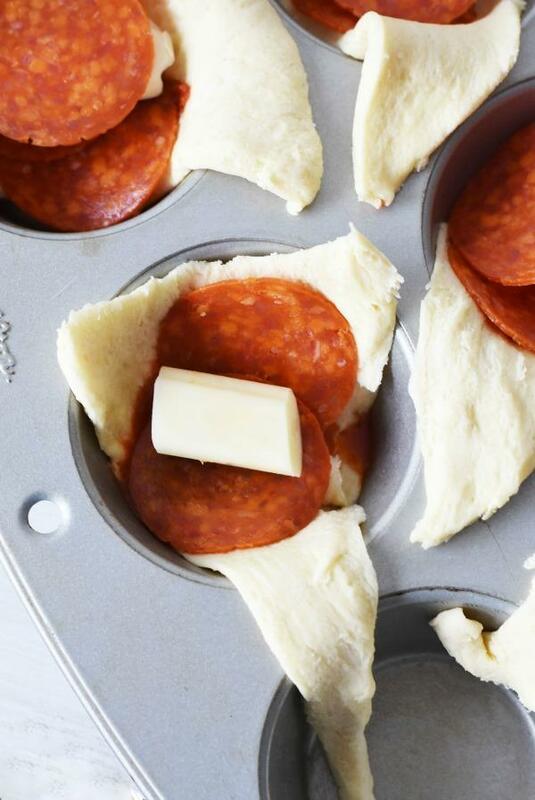 Wonder if I could make them smaller w/ mini pepperoni in mini muffin tins? Maybe cut each triangle of dough in half? I cannot suggest any other method other than the one I have provided, but I totally do not see why not. I think it could work. I do not own a mini pan myself though to test it. Made these and they were a big hit. I might add more mozzarella next time. Sorry, but I have no idea if that would work? This recipe is based on crescent dough only. Maybe you should make grilled pepperoni and cheese sandwiches? I didn’t have any Cresent rolls so I used the Pillsbury pizza dough. I rolled it out so it was a little thinner. Cut it into 12 squares. I also brushed it with melted butter & fresh minced garlic after they were done baking. Delicious! Thank you so much! I need to update this for all! Sorry about that! I made these a few weeks ago and my girls loved them. I was just asking them what they wanted for dinner and they were both trying to describe these! I subbed ham in for the pepperoni. Great and simple recipe, thx! I just ate these except I used ham and pineapple! Yummy, yummy! My daughters just LOVE these and they even like to help make them with me, thanks for the recipe, will be trying other combos in these as well! Ham and cheese is next! Spray is optional! I emailed you but wanted to let any others know! can i use fresh mozzarella? These were an easy hit! Thanks! Can i put these in the pan and bake them several hours later? Hi, I know I replied by email, but for anyone else wondering–I believe these would get spongey, and soggy. This sounded like a good idea but turned out sub par. Maybe it was something i did wrong, but these were very soft and not all that crispy, crunchy (that i expected based on the photo) . Very soft and not much of a flavor kick, i baked longer to try to get them to crisp up and it never happened. Maybe would try again if i have all the ingredients on hand but wasn’t really impressed. I’m sorry to hear that Sarah! 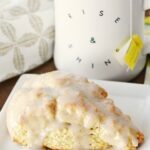 Did you grease or spray non-stick in the muffin tin and bake at the correct temperature of 350F? Crescent roll dough usually crisps up very easily in the oven. Sometimes oven temperatures vary, so i’m wondering if your oven runs a bit cool. Also, make sure you use the center rack position. I wish you success in your future baking adventures! We love these and have made them many times. My 5 year old and 8 year old kids can make them by themselves, and I pop them in the oven. So easy and delicious!! Than you so much for stopping by!! Glad to hear you all love them!